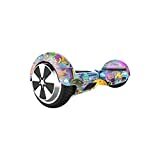 A hoverboard or (self balancing scooter) is the ultimate gift for all the family – young kids, teens, and adults will all want to join in the fun and have a go on this fun personal transportation device. But what if you’re buying specifically for a younger kid? What’s a good, safe hoverboard for 6 year old kids? Or for a 7 year old? All standard size hoverboards (those with 6.5″ wheels or bigger) advise a minimum weight of approximately 44lbs. This shouldn’t be a problem for most, as the average 6 year old usually weighs 45lbs+. The reason for the minimum weight is because hoverboards are controlled by shifting your body weight, so a child that weighs less might find it a little more difficult to control the board safely. That doesn’t mean that your kid won’t be able to ride a hoverboard if they weigh less – it just means you may need to be a bit more careful with supervision and help when learning how to ride. I don’t recommend it, but I’ve seen kids as young as 1 year old (on Youtube) riding a hoverboard. Don’t forget to take the upper weight limit into consideration as well if other family members will want to try the board. Most standard hoverboards carry a max weight of about 220lbs, but some (particularly off road hoverboards) can carry weight from 260lbs up to 380lbs depending on which board you choose. As I’m sure you’re aware, there were some fire hazard issues with hoverboards when they initially came on the market. Today, in 2019, this is no longer a problem as hoverboards now undergo stringent testing to gain UL certification. 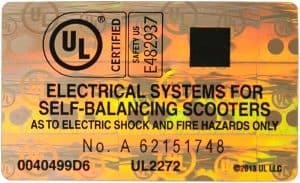 The hoverboard standard you must look out for when buying a board is called UL2272 – any certified product should have the UL holographic label and Enhanced Mark on the product to identify it as genuine. Not ALL hoverboards on the market have UL certification – the safest place to buy is from a marketplace that requires it of all their hoverboard sellers. Online marketplaces such as Amazon, eBay and Best Buy ONLY allow the sale of UL2272 certified hoverboards so its safe to buy from there – plus you can check out consumer reviews of the product before you buy! Speed (some hoverboards have a higher max speed than others) – you probably won’t want a 6 or 7 year old going super fast around your back yard in case they lose control. A training/learning mode would be a useful addition for learners on their first board – many hoverboards now have this mode, but not all. It’s not strictly necessary as it’s pretty easy to balance on these boards seeing as they have “self balancing” technology, but nice for beginners. Durability – how resistant is the board to scratches and scrapes and bangs. No hoverboard will be immune from this, but some take a beating better than others. Slip resistant foot pads are important so that your child won’t fall off easily. The following are hoverboards that are suitable for younger kids, but can also be used by older kids and even adults! My no.1 choice is the Swagtron T580 because this is an established brand with a history of producing safe, durable electric scooters and hoverboards. The Swagtron also features Smart Battery Management and Sentryshield Technology to protect against fire hazards and over heating. Just the kind of safety you need for young kids! Remember that even if your hoverboard is UL2272 certified, this does NOT address safety when riding. Young children should be supervised, especially when learning to ride, and proper safety precautions should be taken when riding. Always follow the manufacturer’s guidelines for safe use, and safe charging. 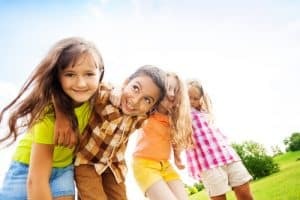 Children should also wear personal protective gear e.g. a helmet & elbow/knee pads. In 2019 hoverboards are safer and more durable than ever, now available fully UL certified and no longer a potential fire hazard – your hoverboard is as safe as any other electrical item with lithium battery e.g. your laptop or smartphone. Not only that but due to growth in competition, hoverboard prices have dropped to much more affordable levels this year and you should be able to get one $100 cheaper now than they were in 2016 – 2018. A hoverboard for 6 year old or hoverboard for 7 year old shouldn’t cost more than $200 if you’re shopping for a standard 6.5″ wheel hoverboard. OR if you’re looking for something a little more up market with more durablity AND versatility, check out the best off road hoverboards in 2019 – these will have your little one riding over grass, sand and all sorts of terrains that the cheaper ones won’t. They’re a bit more expensive, but can be worth the extra investment – particularly if the whole family will want to ride.